Look! Look! My very first practice socks!!! :-D This was fun. I can see why people are addicted. When I made the 1st, I wrote down how many rounds I did for the leg and how many rounds for the foot (46 & 33), thinking I could use this in making its mate and to make sure both were identical. Well that was no help in the 2nd. I tried knitting this 2nd one tighter since I thought the 1st was a bit on the loose side. As a result, the row gauge changed. Am I supposed to block these? I don't have any sock blockers yet. Oh, about that title. It should mean that the socks are finished. I was having a brain fart and couldn't remember how the adjective fini (pp of finir) should agree with the fem pl word chaussettes. Fini is masc, finie is fem. So finies is fem plural, right? This 2nd one fits better than the 1st one. The laddering has improved compared to the 1st, however you can still see it on both sides. Did I mention it is very difficult to take photos of one's foot? The top view is not very exciting. I think the 1st is on the left, 2nd on the right. I love the heel flap. I actually made the 2nd sock slightly differently than the 1st, you know, just to try something new. The heel flap is worked a little differently. Same but different. I think I did a better job with it in this 2nd one. I also worked the whole gusset section a little differently too. And to continue in this theme of trying to do things a little differently, I also did a slightly different toe decrease in the 2nd one. The 1st sock is on the left, where I did slow decreases and then faster ones nearer the end. The 2nd sock on the right had constant decreases all the way, making it more "pointy". I haven't decided whether one way is better than the other. I think I like the more "rounded" toe (left one) a little bit more. I guess I got a little picture-happy since this is my very first pair of socks. I did have fun knitting these, even though they were on itty bitty 2.75 mm pointy sticks. I'll definitely do another pair. I think Practice Pair #2 should start at the toe. I'm not sure when I will actually wear these socks. Probably just around the house. I've been wearing shoes similar to the one shown here with thin trouser socks. These knit socks would be a bit too thick for the shoes. Your first pair of socks?? Really? After all of the beautiful creations you've made?! 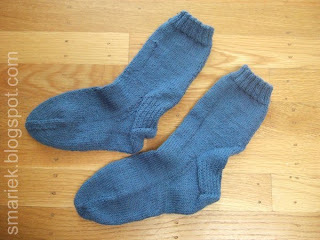 Great job on your first pair of socks - they certainly look waaaay better than my first pair! 1st socks! Congratulations! Welcome to the Sock Addiction Club. 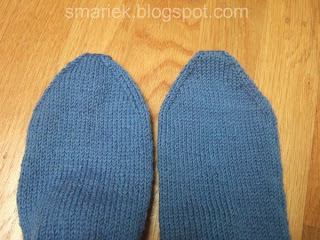 Your socks came out great and it was a good idea to try different heel and toe on the second one. I never thought of that. 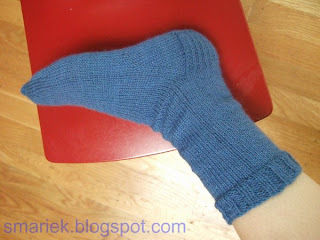 I keep track of how many rounds on the 1st sock so the second will turn out the same but I knit it at the same gauge. Brava on your 1st attempt. Welcome to sock knitter anonymous as well. Keep up the great work! Wow, those are pretty impressive; hard to believe they're your first pair! They look great Marie. You go girl! What an awesome job you did on your first socks!!! You go gf!!!!!! I am also a rounded toe person, I think it feels snugger on the foot. Your first pair looks GREAT!!! My first pair would've fit the Jolly Green Giant. Happy Socking!!! Great looking first pair, just what your fans know you'd make. The ladders, well, they happen and you'll learn to snug up those stitches as you make more. As far as I can tell, sock blockers just make them look prettier for photos, since your foot is going to stretch them differently than a flat piece of wood. Now it's only a short wait till you start designing your own. I am looking forward to that. HeHe I can see you doing the happy dance when you finished the socks! It's a great accomplishment. Did I mention how the 2nd sock is ALWAYS better than the first? It fits better, it looks better, and it 's easier. They look great and you should be proud! They are beautiful! tres magnifique! What pattern did you use? do you have a book, where you are going to be knitting all the socks and showing us? hee hee cuz you're certainly speedy. Way to go!! Love those socks. You did a really great job. I figure my feet blodk them. Can't wait to see your next pair. 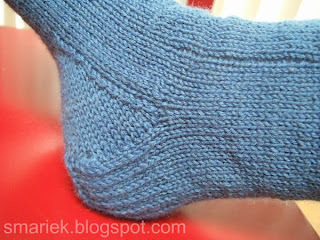 A suggestion: if you knit socks with 2 circs, you can go down a needle size on the sole and make a firmer fabric where it gets the most wear. Just work the sole on a smaller needle which you can't do with dp's. Also, go down a needle size to work the toes. It doesn't change the size. Congratulations on your first socks! They look great. Sock blockers? AKA feet. Also, as you wash and wear your socks, your column of loose stitches will even themselves out. Not to worry! I'll keep my eye open for more that the Redheart sock yarn, should I find any I like, then I'll pick you up a couple as well ( you must admit this stuff is pretty reasonable). Thanks for the heads up. 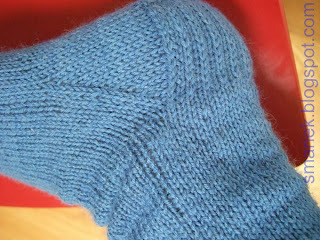 Lovely first socks - nice to hear about the experimentation too. I'm impressed. 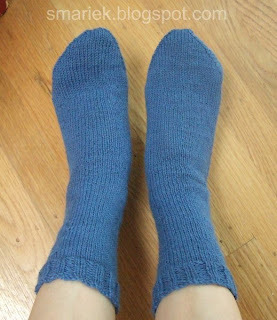 If I try knitting socks, I may learn how to do that "two socks at once" method. Yours look fantastic! Those are your first pair of socks? Wow! They look great. And I like the TARDIS blue yarn! Those are pretty darn good for practice socks! Changing around the toe was a great idea, gives you more experience! They look great, and I agree it was intelligent to try different heels/toes. 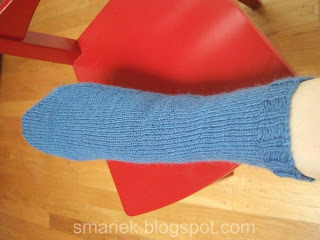 Refining the fit is one of the pleasures of wearing hand knit socks. So finies is fem plural, right? Tes chausettes sont tres belle! Don't worry about blocking them, your foot will do that very nicely. I personally like the rounded toe better than the pointy toe. I usually end up with my big toe going through the pointy tip and I hate that. Awesome! 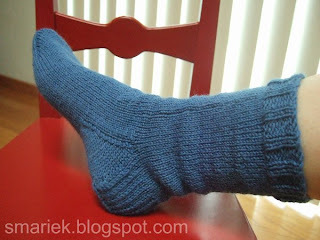 I'm going to make my first pair soon as I've won some lovely sock yarn. One more question. Did you have any problems with the ribbing on the dpns? I can do st st with no problems at all. when it comes to the ribbing, I'm having all kinds of trouble! It's mostly in the purling. I'm getting so frustrated.